I was married almost forty years ago. However, the day is still crisp in my mind and heart as if it were yesterday. I am a lucky man...no, more blessed. 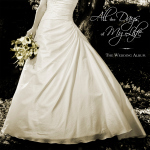 The day became a living memory again as I listened to Vicente Avella's exquisite recording, The Wedding Album – All the Days of My Life. His contemporary solo piano music graces eleven tracks of elegant melodies. The music would enhance any occasion, not just a wedding, for it is soft, gentle, and pleasing to the soul. Avella calls upon well-known classical pieces and adds a few original works to enhance the experience. And it is an experience. It would shine a light on anyone or anything without losing substance in the brilliance. Bach's glorious cantata, Jesu, Joy of Man's Desiring fittingly opens the recording. There are very few songs that can stir passion in the soul like this one. Vicente starts cautiously, choosing his path carefully before stabilizing his tempo into the familiar. Then he adds new riffs that cycle back to the original, giving us a sense of what is old and what is new. I sense a theme here. Dressed in White is as crisp and contemporary as starched linen and Chantilly lace. For some it will be a climax of choices, the consequence of many tears, and the answers to countless questions. To others, it suggests a moment in time where your breath will be taken away, your heart will race, and your soul will question its worthiness. All the Days of My Life is an original tune by Vicente. It is a memorable song full of promise. Promise by way of vows said and unsaid. Vows taken with the lips and the heart. Vows made with the eyes and the soul. I will love you deeply and often. I will hold you above all else, especially myself. Promise as in hope for the future. We will build together with wood, stone, and love. Another of Vicente's original tunes is called Romanze. At first, I thought it melancholy, but then I realized it was a song to be danced by two hearts finally in syncopation. There is nothing elaborate here, just a sweet, slow waltz where you hold on and drift together, finally of single purpose and in one direction. The song Spring is a cleverly disguised version of Vivaldi's first movement from his Four Seasons Concerto, namely Concerto No. 1 in E major, Op. 8, "La Primavera". This version contains everything we need for a successful wedding day. Warmth, sunshine, and hopeful hearts. Blue skies are something borrowed for the occasion. The Wedding March is not your grandma's Mendelssohn's Wedding March. No booming pipe organ shaking the rafters in St. Peter's here. This is beautifully articulated with a delicate hand and a passionate soul. It sounds like all the songs we heard this day are combined to create a grand finally. Vicente Avella is not only a noted composer of contemporary music, but also a creator of numerous filmscores for television and films. He holds a Master’s Degree in Music Composition from the Eastman School of Music and a Bachelor's Degree in Piano from Indiana University. He has also garnered numerous awards, including ASCAP's Award. I do not think I ever heard an album so apropos to its theme. Everything about the recording is superb. The audio quality and production values are perfect, but that is to be expected with Will Ackerman as the producer and Tom Eaton at the mixing board courtesy of Imaginary Road Studios. Furthermore, Vicente Avella has adapted, created, and composed a collection of music that, with its innate splendor, shall remain timeless.